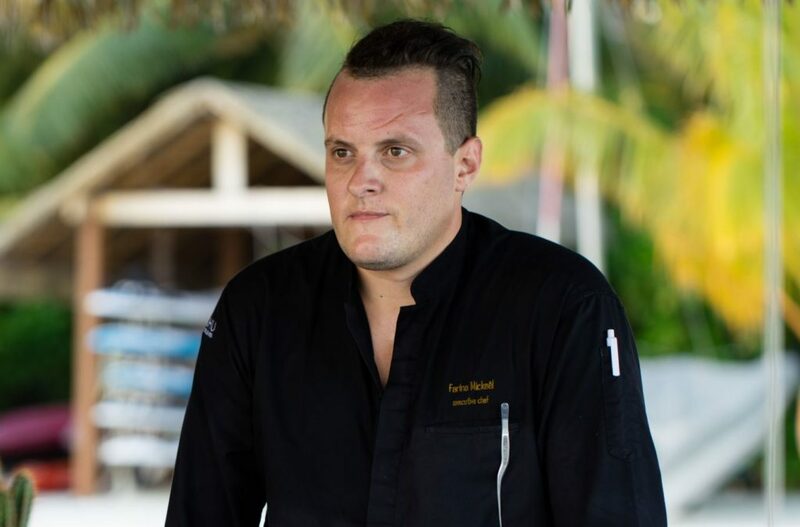 French-born Executive Chef at Kandolhu Maldives, Mickael Farina is a descendant of a multicultural close-knit family, with Spanish, Italian, Vietnamese and Algerian ‘Pied-Noir’ roots. He has always had scores of culturally diverse influences around him, resulting in him embracing and celebrating other cultures while never needing to identify himself with any one country in particular. Born and raised in Carry-le-Rouet, a small commune next to the Mediterranean Sea near Marseille, south of France, Mickael was surrounded by sun, sand and the ocean, as well as the finer greenery Mother Nature has to offer. His father and his family spent their entire lives there and still live there to this day. 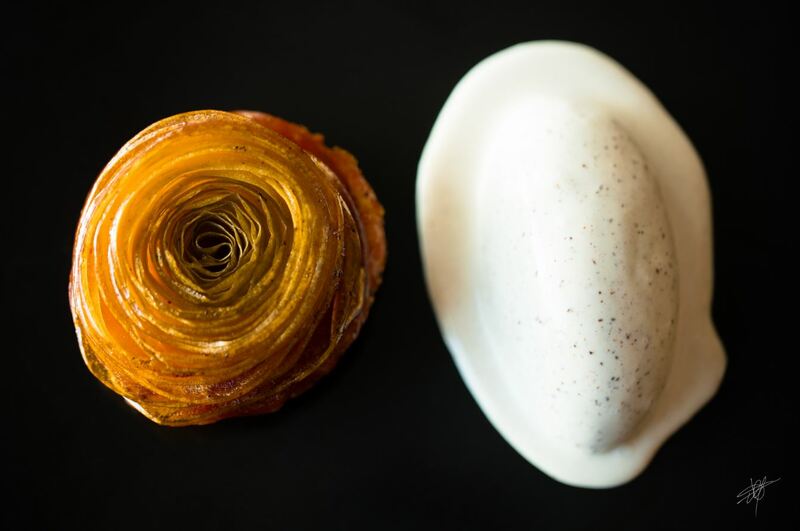 By the age of eleven, Mickael had discovered a passion for food and dining as well as travelling and decided that he wanted to be a chef working in a busy kitchen. At age 15, he joined culinary school to study the fine art of cooking while working part-time as Commis de cuisine. 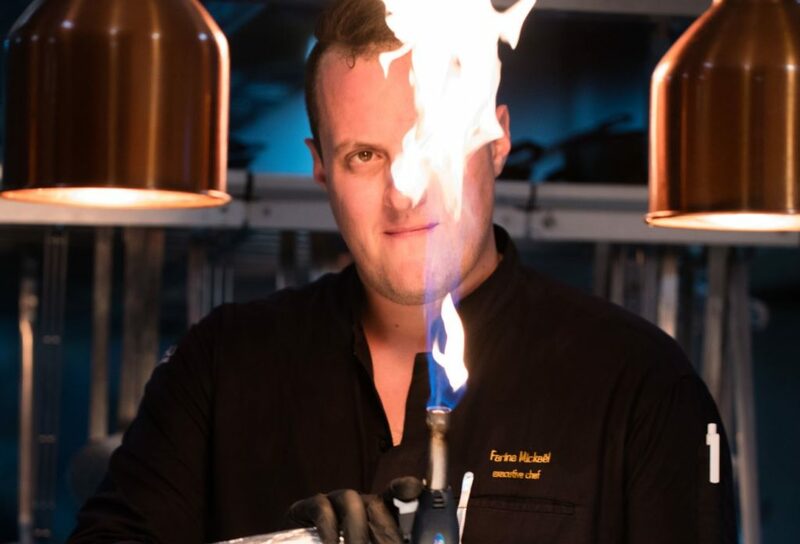 Upon graduating from Ecole Hoteliere, Saint-Vincent a Montlucon, he immediately started his hunt to gain experience at the tender age of 17, first working in Ireland at La Marine French Bistro at Kelly’s Resort Hotel as a Demi Chef de Partie, then moving on to Australia to work as a Sous Chef at Bay 88 and The Boatshed, as well as The Landing Restaurant in New Zealand, until finally settling in the Maldives working at Cocoa Island by Como, Jumeirah Vitavelli, and then Kandolhu Maldives. By the age of twenty-eight, this culturally rich individual has already gained immense fame and recognition in the hospitality industry. True to his word, upon trying the seemingly bizarre combination of chocolate covered chicken, Mickael and his family were left in stunned awe of his grandmother’s accomplishment. 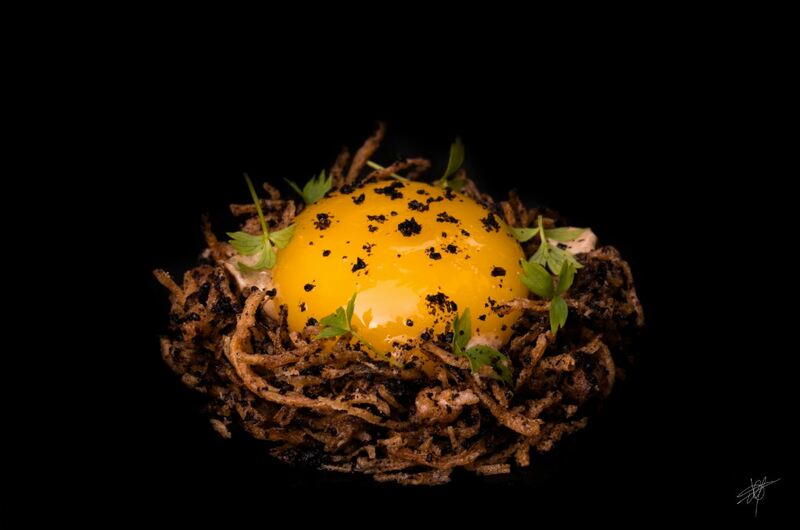 She had succeeded in winning over a traditional French family with a Mexican-inspired dish, which helped him come to the realisation that French cuisine is not the only ‘good’ cuisine in the world. This drove home his ambition to be a culinary artist even further, fueling his motivation to travel the world and try his hand at different cuisines. He was only twenty-three years old when he decided to move to Asia, a drastic move but one that proved to be the perfect decision for him, despite being one of the biggest challenges and lifestyle changes since he left home. While he was waiting for a New Zealand visa extension, one of his previous Chefs contacted him to offer an opportunity to expand his horizons. “He asked me if I would like to be his sous chef at Coco Island by Como in the Maldives, assisting with managing over 30 kitchen staff, solid reputation, luxury hotel industry, [the offer was] a unique opportunity I could not miss on,” he said. For some expatriate workers, it is a challenge to get used to the island life, but Mickael’s experience proved to be easy and effortless, as he enjoyed working and exploring the islands and resorts on his off days. His passion for travelling and wandering never losing its flavour, he delights in visiting other resorts and the cities on his long holidays, expanding his globetrotting repertoire. This major lifestyle change set him up for the level that he is at now, at twenty-five years old, working as an Executive Chef at Kandolhu, continuously learning and progressing every day with his own team. Venturing into his work at Kandolhu, he was first approached by a recruiter who offered to consider an opportunity to be in command on a small island. He had become frustrated at his previous employment for having to report to other chefs, thus reporting to himself as well as Kandolhu having four other restaurants (now five) had immediately grabbed his attention. He was asked to step into an interview by Marc LeBlanc, inviting him to scour the island and its restaurants. 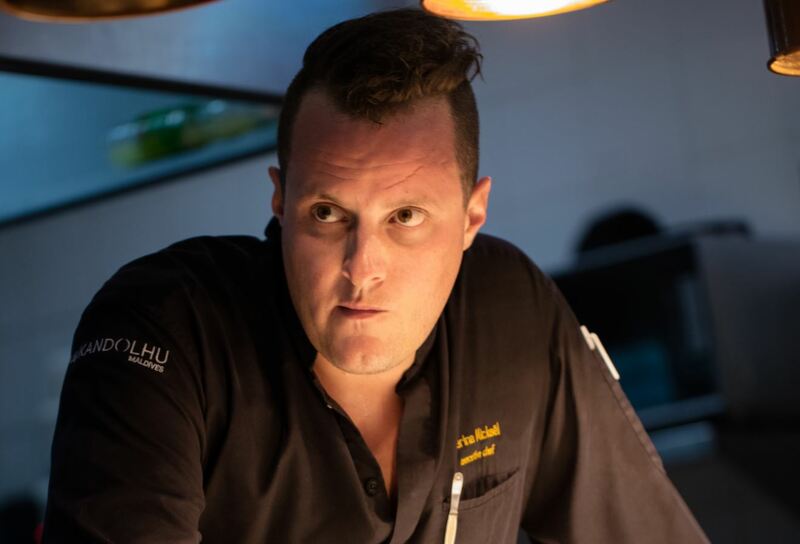 Kandolhu had had three different executive chefs during the past 18 months before he started working around August, three years ago, and Marc wanted a young, strong chef with a European background with previous Maldives experience. 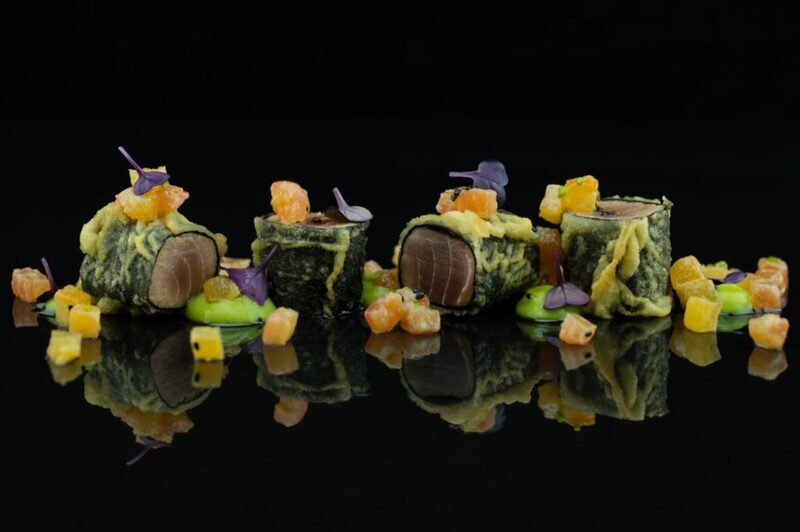 Not to be outdone, after signing on to the resort, Mickael took his time to carefully reinvent the menus and create a more diverse bar menu—which was all-in-all over 160 dishes long. He knew his system had to be well organised and smart, and accordingly, he trained his staff to utilise this in its maximum capacity by avoiding waste and meeting targets efficiently. He works in an exceptional team with his managers, Marc and Laura Robinson, and the rest of his colleagues; the group general manager Latheef, and their director Andeen, who gives them an endless amount of support. The book was initially an idea proposed by his Director, who has always wanted Kandolhu to have their own cookbook. They have now printed it for a second round with the first 300 publications all sold out, which is an inspirational accomplishment since they are a relatively small island that house a little over a thousand guests each year. 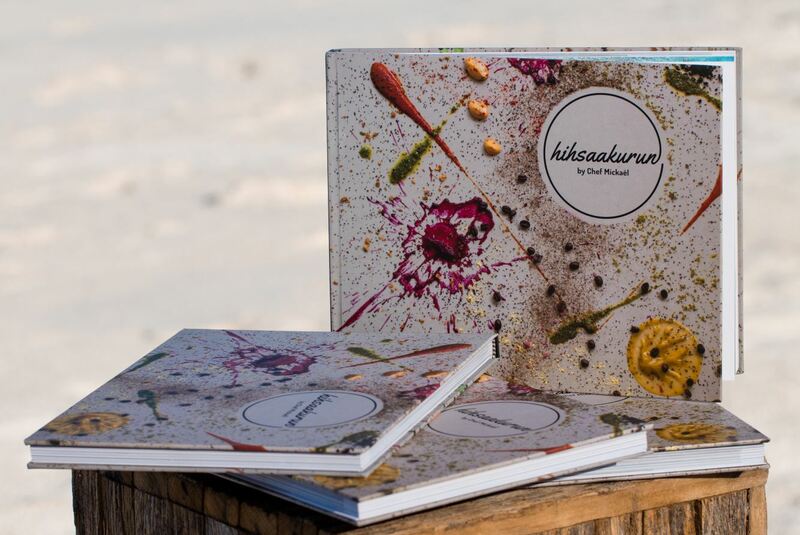 The debut cookbook ‘Hihsaakurun’ by Mickael is a culinary and visual journey that takes readers and food enthusiasts around Kandolhu and further into the twinkling islands of the Maldives. The inspiration for the name of this book and the main guideline behind it came from his great love for Maldivian culture. 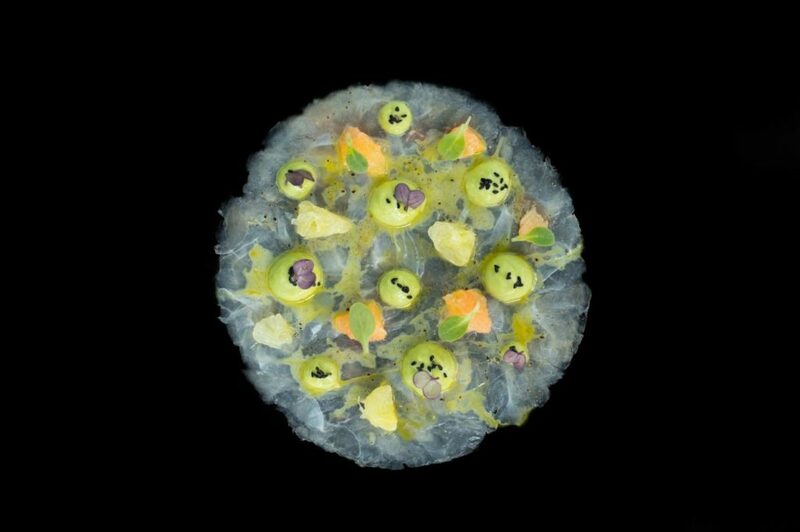 The magnificently illustrated book showcases the talents of Kandolhu’s staff, united with recipes from Chef Mickael’s most creative dishes that were served during his first year. This cookbook encompasses Breakfast, Finger Foods, Soups & Veloute and Norimaki to Main Courses from the Garden, Sea and Land as well as Pre-Desserts and Desserts and many more; a truly comprehensive list of recipes from Kandolhu’s very own kitchen. Interlaced into the book is the story of how Kandolhu flourished from humble beginnings to become the celebrated five-star luxury haven it is today, as well as the personal story of the chef at its helm. 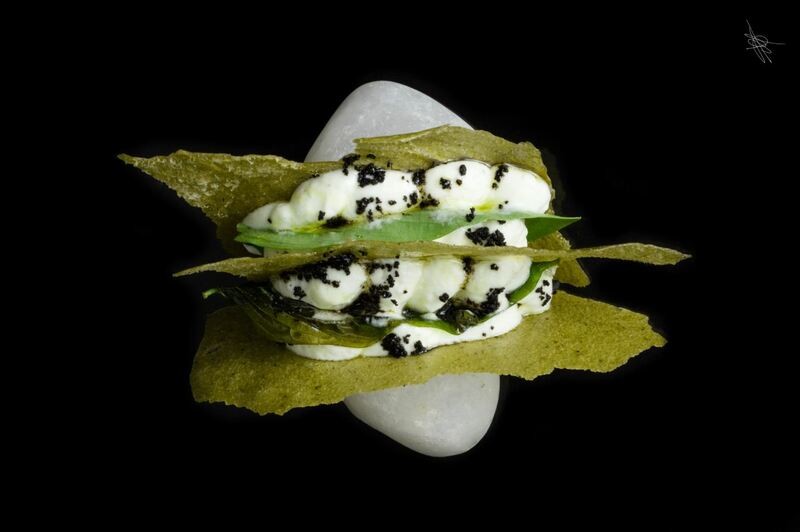 Mickael believes in order to become a chef, a person needs only one thing: a passion for food. Without it, any job would feel tedious and lethargic. He encourages new workers coming into the industry to care about their tasks and everything they put up in front of their guests, and finally, to be fair to fellow coworkers and to respect them.